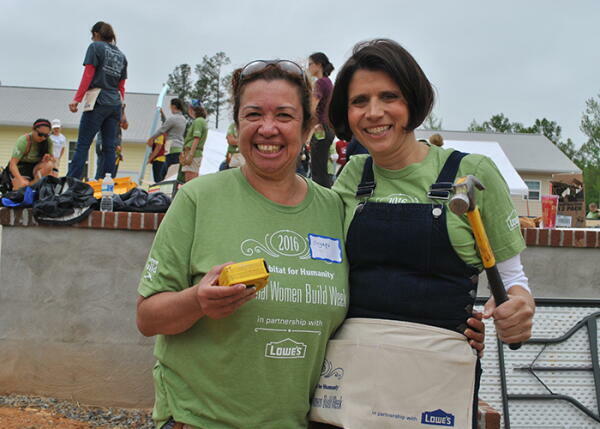 Future homeowner Suyapa Mejia and Keynote Speaker LisaMarie pose for a photo at Women Build Day. Thanks to LisaMarie for writing this guest blog post! Change begins with anticipation. After completing the significant application process, waiting for the decision, and spending the required hours helping to build others’ houses, Habitat home owners develop a tremendous anticipation for their own house to be built. The next phase in change is ending. Many endings occur leading up to a move; many are hard, despite the excitement and anticipation about the new house. Suyapa and Michelle’s change of address and transition from old home to new house, new neighborhood, new school, and new friendships will be overwhelming at times. But their path will be less steep than most who change addresses because Habitat communities are uniquely supportive. Finally, new beginnings will take place as Suyapa and Michelle stand at the doorstep and turn the key to their new house. The beginning of their life in their Habitat house will be an easier transition because they’ve literally had a hand in the building process. Friendships were built along with the house. Neighbors, volunteers, and Habitat personnel are connected by shared experiences of having built each other’s’ houses and having similar life paths that made them eligible for their Habitat homes. They have empathy, one for another. I’ve purposely been saying “house” because “home” happens over time as they settle in, when routines are built, when where they came from becomes less significant than where they are now. As the sense of belonging in this new house grows, it finally becomes their home. Suyapa and Michelle’s transition into their new home will be enjoyed with peaceful fulfillment because of the personal engagement that has come from helping to build it with their own hands. Because Habitat owners and neighbors are intimately engaged together in the creation of their houses, and collectively their homes form their neighborhood community, more often they readily experience the positive wonder that can accompany this significant change. Check out the photos from Women Build here.